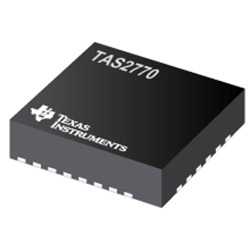 The Texas Instruments TAS2770 is a mono, digital input Class-D audio amplifier optimised for efficiently driving high peak power into small loudspeakers. The amplifier can deliver 15.4W of peak power into a 4Ohm load while sustaining 11.6W continuously with less than 0.03% THD+N at a battery voltage of 12.6V. Integrated speaker voltage and current sense provides for real-time monitoring of loudspeaker behaviour. A battery tracking peak voltage limiter with brown out prevention optimises amplifier headroom over the entire charge cycle of 2S or 3S battery systems. Up to eight devices can share a common bus via either I2S/TDM +I2C. The device is offered in a 26-pin, 0.4mm pitch QFN for a compact PCB footprint.